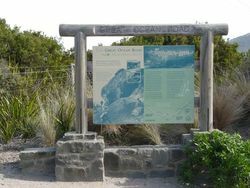 A plaque commemorates the Great Ocean Road which was built to commemorate those who served in World War One. The plaque was unveiled on the Memorial Arch in 1939. The Great Ocean Road hugs the south-west coast of Victoria, and it is also the largest war memorial in the world. The road officially stretches from Torquay to Allansford near Warrnambool. 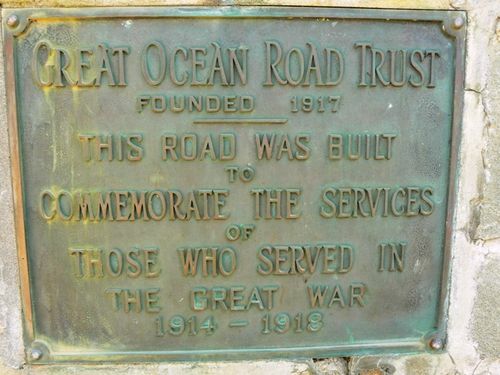 The Great Ocean Road was first planned towards the end of the first world war, when chairman of the Country Roads Board William Calder asked the State War Council for funds be provided for returned soldiers to work on roads in sparsely populated areas in the Western district. By the time of World War One, the rugged south-west coast of Victoria was accessible only by sea or rough bush track. Besides being dedicated as a memorial, it was also envisaged that the road would connect isolated settlements on the coast, and become a vital transport link for the timber industry and tourism. Approximately 3,000 workmen built the Great Ocean Road over a period of about 13 years between 1919 and 1932. The vast majority were returned soldiers from World War One. It was one of the work programs that provided not only employment but the soldiers themselves were very proud to be involved in this as a memorial to all the diggers who lost their lives and fought in World War One. The road was actually carved out of the cliffs using pick and shovel and horse and dray. On 18 March 1922 the section from Eastern View to Lorne was officially opened with celebrations. for nearly a mile from each approach. It will be built of timber and stone, and will weigh approximately 50 tons; it will have a clear space of 26 feet for traffic, and will be 50 feet wide over all. On one side will be a bronze tablet to the memory of the late Mr. McCormack, and on the other a tablet to the memory of those who served in the Great War. Age (Melbourne), 6 June 1939.